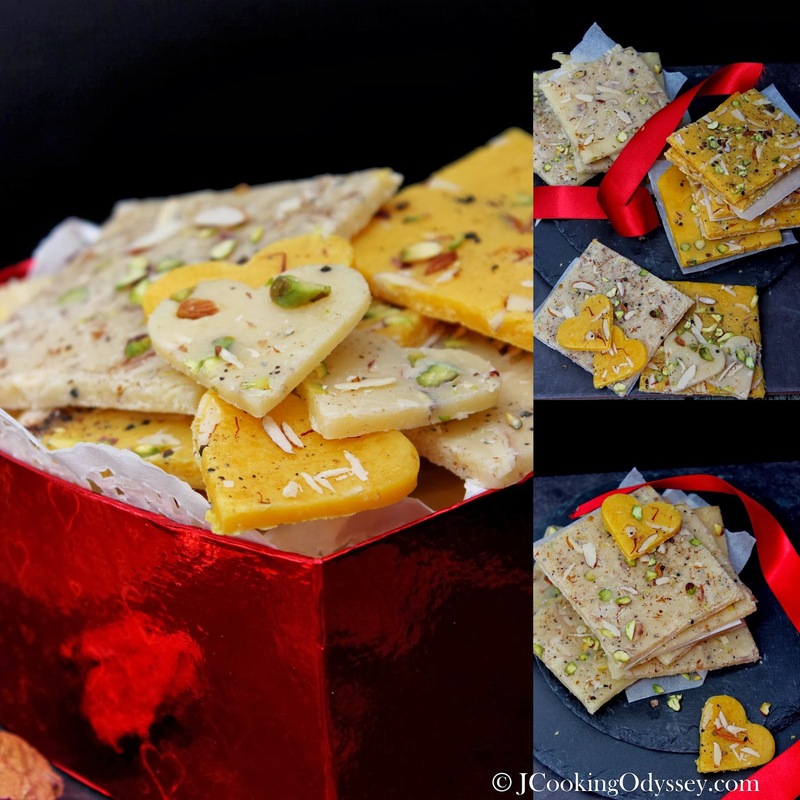 Jagruti's Cooking Odyssey: Bombay Ice and Golden Halwa - Sweets for your Sweet ! 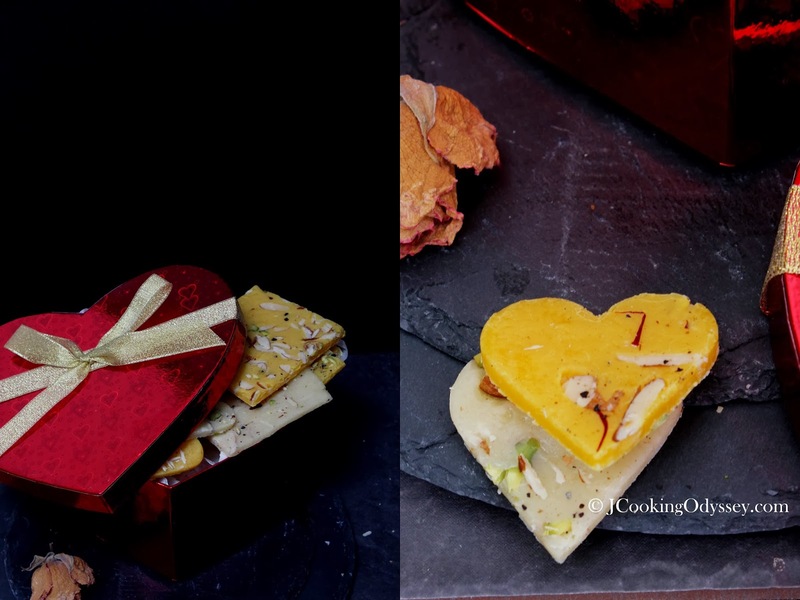 There is no denying that the craze surrounding Valentine's Day has caught on the fancy of young India and it's younger generations in recent years, while some say perhaps worst time for elders still coping with the sights of unabashed public display of affection by today's youngsters. While a lot of newsprint and airtime may be wasted on debating its pros and cons. If I go and look back to my time in India which is almost 25 years ago Valentine's day was an alien in our city or community or at least where I grew up. That time we hardly exchanged even birthday cards, the famous card shop Archie's was only opened that time and to enter that shop for people like me very unlikely. It was believed that you need to be rich to enter that shop, and good knowledge how to buy all those cards and gifts. Lol, I only came to know about Valentines day when I married and stayed back in India for few months to clear my visa's to reunite with my husband. He left India in January and in early February, our postman started making frequent visits to our home, almost everyday I was receiving cards from hubby, images with hearts,rose flowers, cupid and love birds. I was surprised and quite shy to tell anyone or to show these cards, just kept putting aside so no one in the family can find out. Every single time he called, he asks me did you received the card, I just say yes because I didn't know how to answer him or what to do in return, but I am sure he didn't mind or even he did, he never mentioned to me. So I came to know everything about this globally popular Valentine's day when I settled here in UK and understood madness about it. After so many years of togetherness now, we don't need to whisper or buy those cards to say that we love each other. Every single day it shows in our commitment , behaviour and care that we take for each other is good enough for both of us. We stand together thick and thin no matter what life throws at us. I feel content that he brings tea up in the morning and he is more than content by the food I serve, so this is our way of Valentines day everyday !!!!! 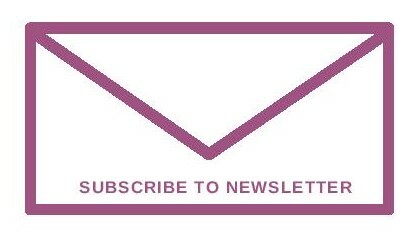 We are wishing a very Happy Valentine's Day to our readers ! What more better way to celebrate this day with these delicious, mouth watering, irresistible home made Ice halwa aka Bombay Halwa with the goodness of fresh ingredients. This wonderful and rich treat, favourite of both of us and our kids, a lovely change from chocolates on this day ! 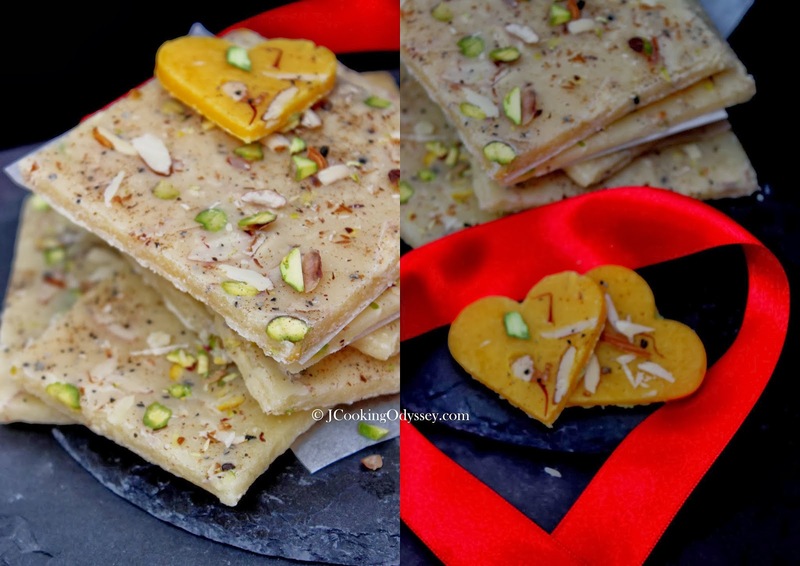 Ice Halwa, Golden halwa - they look like they cost a fortune but are easy to make. 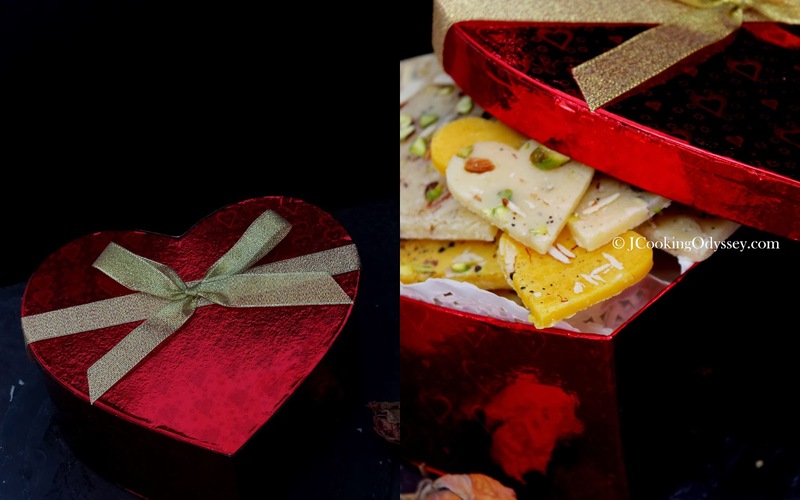 These make gorgeous edible gifts, tie with festive ribbons and present them to friends or your loved ones and indulge in the glory of doing a fine deed..:) definitely you'll receive lots of 'oohs' and 'aahs' !! Ice Halwa is one of my and hubby's favourite since our childhood, every single visit by my dad to home from Bombay, always a big tin of famous Ice and golden halwa from Mohanlal S Mithaiwala was a must amongst other treats for us. Same routine started with me, every single visit to India, I never failed to bring a few packets of this halwa for hubby and kids until it was available in London. 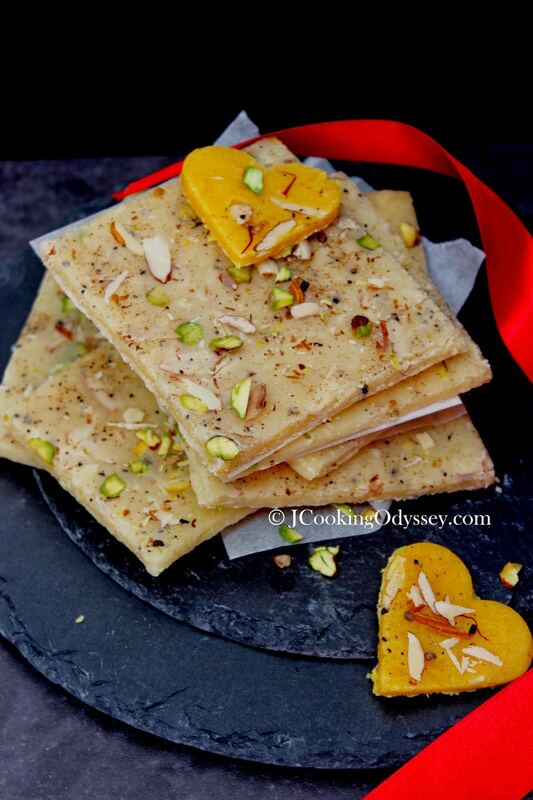 Delectable and moreish thin slices of Ice halwa , we never get bored of. It was my hubby's dream that if I can make at home, it would make him very happy. So I tried many times , sometimes I got successes and sometimes for one or the other reason I failed to achieve same texture and taste as the original recipe. But with practise and few key rules that I applied, past few years I am having same results every time. See Notes for key rules. Keep ready butter or greaseproof paper and rolling pin on a smooth surface. Take a non stick pan, add ghee and melt for few seconds on a heat. Switch off the heat. Add flour, sugar and milk. (add food colour if you're making golden halwa). Mix well. Once again turn the heat ON and start cooking the mixture, keep stirring continuously on a medium heat and make sure there is no lumps formed. While on heat keep mixing until the runny content turns to a thick mass. switch off the heat and quickly transfer the mixture on a butter paper. 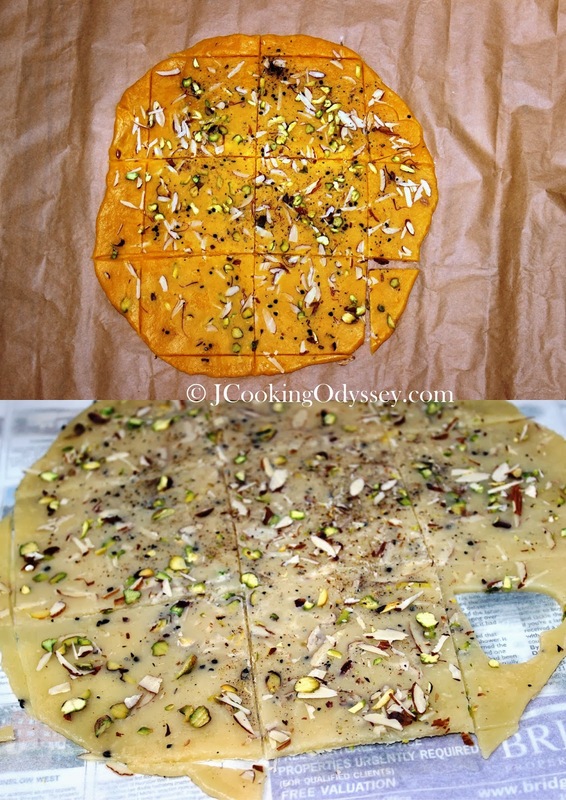 Now lay another butter paper on the mixture and quickly start rolling mixture, remove upper paper and generously sprinkle almond and pistachio slivers, cardamom seeds and saffron (for golden halwa) and once again lay the paper on the half rolled mixture. Again roll out the mixture gently and roll to a 2-3 cm thickness and carefully lift off top layered paper. Let it cool for few minutes, then cut the halwa squares but do not lift or remove. When they are ready you'll see shiny surface , dry and stiff enough to lift. I tried various supermarket plain flours , every time I achieved different texture, so I now I stick with only one supermarket's flour, which gave me an excellent result. In UK I use Tesco brand plain flour but not the value one. I use only homemade ghee made from organic butter. make sure you stick with accurate measurements, one spoon here and there your dish can get ruined. 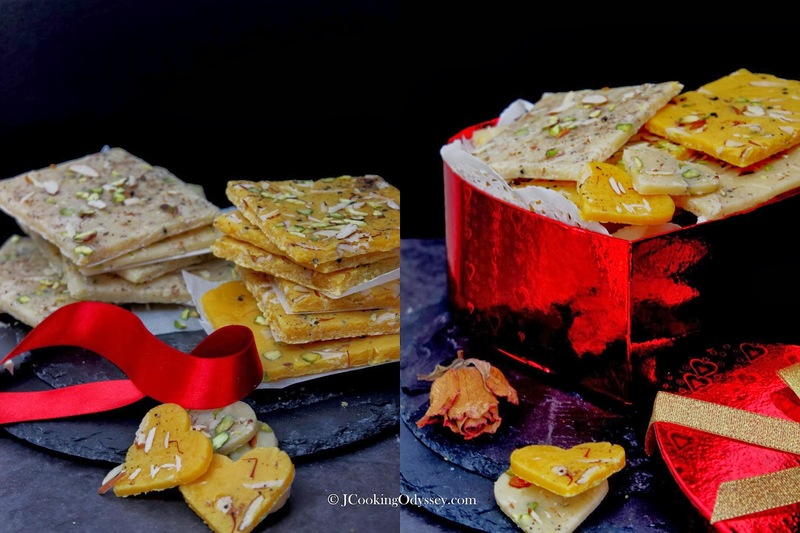 Bombay Ice and Golden Halwa is a popular sweet delicacy from the state of India, Maharashtra. Keep ready butter or greaseproof paper and the rolling pin on a smooth surface. Take a non-stick pan, add ghee and melt for few seconds on a heat. Switch off the heat. Once again turn the heat ON and start cooking the mixture, keep stirring continuously on a medium heat and make sure there are no lumps formed. Again roll out the mixture gently and roll to a 2-3 cm thickness and carefully lift off the top layered paper. When they are ready you'll see the shiny surface, dry and stiff enough to lift. I tried various supermarket plain flours, every time I achieved different texture, so I now I stick with only one supermarket's flour, which gave me an excellent result. In UK I use Tesco brand plain flour but not the value one. Absolutely gorgeous, this is awesome ! Really nice pictures. 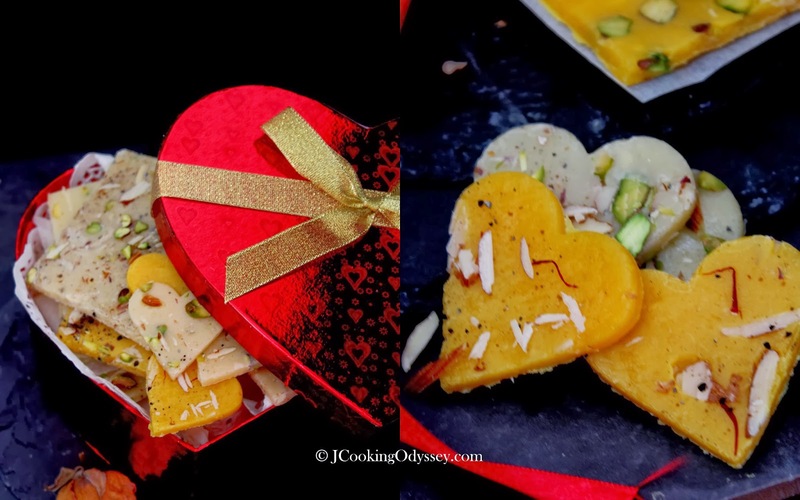 You have made ice halwa into a very romantic mithai:) Maybe one day when I am in an adventurous mood will try the recipe. I hear it's not easy to make. that looks very very good ...def will be trying it .. 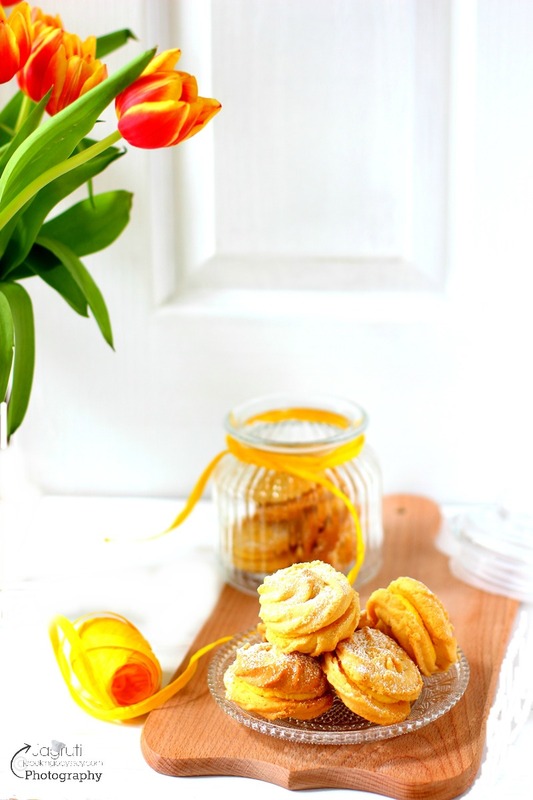 This looks great do send it to Lets cook sweet treats for valentine at simply.food. Very nice ice halwa, this is new dish for me, I never tasted before, but I would love to try, Your presentation and photos are stunning. Did I read that you can buy ice halwa in UK? If so I would love to know where as I just love this halwa. Looks great. What type of sugar do you use? And is the ghee melted? I have used normal sugar. You can me melt ghee in the pan. I did this today with the same exact measurement you've provided and I think I must have overmixed or cooked too much because it harden while I was rolling it in between two sheets of greasepaper and the nuts didn't stick. I did however get the nice sheen on top. So why did it harden too quick when I was rolling it? Any idea? Hi, Really sorry to hear that this recipe didn't turn out good for you. I can guess that yes, maybe you have cooked the mixture too much. Also just want to point out that here in the UK full fat milk has only 4% fat. Those are beautiful. What an interesting dessert and gift! One of my absolute favorite Mithai from India. I LOVE Bombay Halva. Boy do I have some pleasant memories as a kid. This looks so easy. This is such a thoughtful idea as a gift instead of chocolate. It has pistachios and almonds which add to the complex flavor of this tasty treat. I absolutely love Indian sweets, so so tasty. I used to live in Derby, and would take a long walk on occasion, just to visit my favourite Indian sweet shop. I would select some, which would be put in a lovely box. A treasured box of deliciousness. Your recipe is wonderful, and I would be delighted to try them myself. I love your story of Valentines, how sweet. Such beautiful presentation! I love the heart-shaped ones. Brilliant use of cookie cutters. It's not easy making ice halwa look good and you've excelled!